The Westin Chosun Seoul ranks on top once again, sweeping the highly prestigious finalist medal from the Starwood Global Award 2006. This exclusive annual award is presented to the most accomplished hotel among 870 Starwood brand hotels, including Westin, Sheraton, W, Luxury Collection, and Le Meridian. 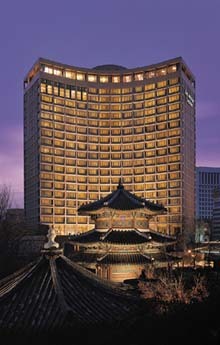 Having received the highest Revpar Index of 131.7% throughout the entire Asia Pacific Region, The Westin Chosun Seoul was awarded for its excellence in 5 areas; GSI (Guest Satisfaction Index), RPI (Revpar Index), MPSI (Meeting Planner Satisfaction Index), Brand Assurance / Overall Rating, and Brand Balance (Balancing GSI, OSAT, Brand Assurance, RPI). Led by General Manager, Mr. Gerhard R.E. Schmidt, The Westin Chosun continues to excel in every arena. From newly renovated luxury accommodations to premier services, state-of-the art business facilities and world-class restaurants, the expansive needs of business and leisure travelers are successfully fulfilled.